Grout Man is a full service grout and tile restoration company servicing The Jersey Shore in Monmouth County, Ocean County and Middlesex County. We perform quality tile work for everything from mold remediation to grout cleaning, coloring, sealing and tile repair. 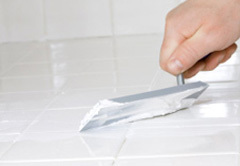 In addition, we specialize in the re-grouting and re-caulking of any tiled surface. If you look at your tile and you do not like the color of your grout, don't re-tile! Grout Man has the best stain on the market so we can change your grout to the color of your choice.Grout Man does the jobs other tile guys just do not like doing. 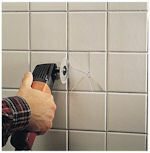 We re-attach loose tiles and we even do water damaged wall repairs. If you have a cracked tile, we can replace it with a new tile. When it comes to grout and tile restoration we do it all. We have been honored by Angie's List with the Super Service Award! We are truly honored! This is a testament to our "Customers First" mindset and attention to detail in ensuring customer service is our first priority! We also have a repeat customer discount. All our services are covered by our 100% satisfaction guarantee! “We needed our shower pan re-grouted. The owner provided a rapid response and was able to come prepared based on pictures sent before job. Provided careful evaluation before the work began and updated as work was ongoing based on any new issues found. Strong attention to detail and quality workmanship throughout." 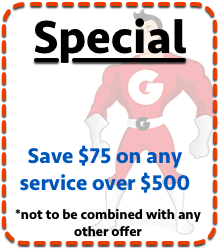 Print this coupon and mention it when booking your free estimate!